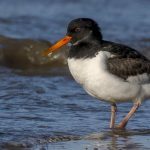 Oystercatcher is the species for which the Wash Wader Ringing Group receives the most recoveries (birds seen or recaught away from the original place of ringing) each year. Of the 45 reports received from the BTO in 2018, 22 were of birds reported in the Britain & Ireland with the other 23 being reported broad. The majority of these were of birds ringed by WWRG and recovered elsewhere but eight were birds that were ringed elsewhere and recaught (or resighted) by WWRG; three of the eight had been ringed in Britain & Ireland whilst the other five were ringed abroad. The trip didn’t start well with the first possible catch called off before we even got to the Wash. Nigel had a bad back and wasn’t even sure that he would be able to make it to the Wash at all, but definitely couldn’t go cannon netting on the Saturday, so the Friday recce was called off.